Crew: Amy, James, Jon, Dad, Bill. 2000 - 5th in Bomber Points at Boone County Raceway. 2001 - 2nd in Bomber Points at Boone County Raceway. 2002 - 3rd in Bomber Points at Boone County Raceway. 2003 - 9th in Modified Points at Boone County Raceway. 2004 - 4th in Modified Points at Boone County Raceway, 1 Feature win. 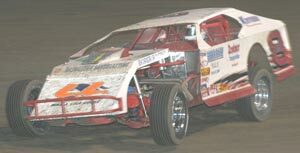 2005 - 8th in Modified Points at Boone County Raceway.